Plutonium-238 (also known as Pu-238 or 238Pu) is a radioactive isotope of plutonium that has a half-life of 87.7 years. Plutonium-238 is a very powerful alpha emitter; as alpha particles are easily blocked, this makes the plutonium-238 isotope suitable for usage in radioisotope thermoelectric generators (RTGs) and radioisotope heater units. The density of plutonium-238 is 19.329 g/cm3. A is the number of 238Pu decays per second per gram (634 billion). Each of the emitted alpha particles has kinetic energy 5.593 MeV or 8.96×10−13 J which is quickly converted to heat when the particle decelerates in the material. Therefore each gram of 238Pu spontaneously generates 0.568 W of heat. The first application was its use in a weapons component made at Mound for the Weapons Design Agency Lawrence Livermore Laboratory (LLL). Mound was chosen for this work because of its experience in producing the polonium-210 fueled Urchin initiator and its work with several heavy elements in a Reactor Fuels program. Two Mound scientists spent 1959 at LLL in joint development while the Special Metallurgical Building was constructed at Mound to house the project. Meanwhile the first sample of plutonium-238 came to Mound in 1959. The weapons project was planned for about 1 kg/year of Pu-238 over a 3-year period. But the Pu-238 component could not be produced to the specifications despite a 2 year effort beginning at Mound in mid-1961. A maximum effort was undertaken with 3 shifts a day, 6 days a week and ramp-up of Savannah River's Pu-238 production over a 3 year period to about 20 kg/year. A loosening of the specifications resulted in productivity of about 3%, and production finally began in 1964. Beginning on January 1, 1957, Mound Laboratories RTG inventors Jordan & Birden were working on an Army Signal Corps contract (R-65-8- 998 11-SC-03-91) to conduct research on radioactive materials and thermocouples suitable for the direct conversion of heat to electrical energy using Polonium-210 as the heat source. Capt. R. T. Carpenter had chosen Pu-238 as the fuel for the first RTG (radioisotope thermoelectric generator) to be launched into space as auxiliary power for the Transit IV Navy navigational satellite, June 29, 1961. By January 21, 1963, the decision had yet to be made as to what isotope would be used to fuel the large RTGs for NASA programs. Then early in 1964 Mound Laboratories scientists developed a different method of fabricating the weapon component that resulted in a production efficiency of around 98%. This made available the excess Savannah River Pu-238 production for Space Electric Power use just in time to meet the needs of the SNAP-27 RTG on the Moon, the Pioneer spacecraft, the Viking Mars landers, more Transit Navy navigation satellites (precursor to today's GPS) and two Voyager spacecraft, for which all of the Pu-238 heat sources were fabricated at Mound Laboratories. The radioisotope heater units were used in space exploration beginning with the Apollo Radioisotope Heaters (ALRH) warming the Seismic Experiment placed on the Moon by the Apollo 11 mission and on several Moon and Mars rovers, to the 120 LWRHU's warming the experiments on the Galileo spacecraft. Radioisotope-powered cardiac pacemaker developed by the Atomic Energy Commission, the atomic battery stimulates the pulsing action of a malfunctioning heart. Circa 1967. With Plutonium-238 becoming available for non-military uses, numerous applications were proposed and tested, including the Cardiac Pacemaker program that began on June 1, 1966, in conjunction with NUMEC. When it was recognized that the heat source would not remain intact through cremation, the program was cancelled because 100% assurance could not be guaranteed that a cremation event would not occur. At present (2003), there are some 100 people in the US who have nuclear powered pacemakers. When one of these individuals dies, the pacemaker is supposed to be removed and shipped to Los Alamos where the plutonium will be recovered. In a letter to the New England Journal of Medicine, discussing a woman who received a Numec NU-5 decades ago that is continuously operating, despite an original $5,000 price tag, some $23,000 in 2007 dollars, the follow-up costs have been about $19,000 compared with $55,000 for a battery-powered pacemaker. Reactor-grade plutonium from spent nuclear fuel contains various isotopes of plutonium. Pu-238 makes up only one or two percent, but it may be responsible for much of the short-term decay heat because of its short half-life relative to other plutonium isotopes. 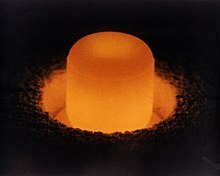 Reactor-grade plutonium is not useful for producing Pu-238 for RTGs because difficult isotopic separation would be needed. Pure plutonium-238 is prepared by neutron irradiation of neptunium-237, one of the minor actinides that can be recovered from spent nuclear fuel during reprocessing, or by the neutron irradiation of americium in a reactor. The targets are purified chemically, including dissolution in nitric acid to extract the plutonium-238. A 100 kg sample of light water reactor fuel that has been irradiated for three years contains only about 700 grams of neptunium-237, and the neptunium must be extracted selectively. Significant amounts of pure Pu-238 could also be produced in a thorium fuel cycle. The United States Pu-238 inventory supports both NASA (civil space) and other national security applications. The Department of Energy maintains separate inventory accounts for the two categories. As of March 2015, a total of 35 kilograms (77 pounds) of Pu-238 was available for civil space uses. Out of the inventory, 1 kilogram (2.2 lb) remains in good enough condition to meet NASA specifications for power delivery; it is this pool of Pu-238 that will be used in a multi-mission radioisotope thermoelectric generator (MMRTG) for the 2020 Mars Rover mission and two additional MMRTGs for a notional 2024 NASA mission. 21 kilograms (46 lb) will remain after that, with approximately 4 kilograms (8.8 lb) just barely meeting the NASA specification. This 21 kilograms (46 lb) can be brought up to NASA specifications if it is blended with a smaller amount of newly produced Pu-238 having a higher energy density. The United States stopped producing bulk Pu-238 with the closure of the Savannah River Site reactors in 1988. Since 1993, all of the Pu-238 used in American spacecraft has been purchased from Russia. In total, 16.5 kilograms (36 lb) has been purchased but Russia is no longer producing Pu-238 and their own supply is reportedly running low. In February 2013, a small amount of Pu-238 was successfully produced by Oak Ridge's High Flux Isotope Reactor, and on December 22, 2015, they reported the production of 50 grams (1.8 ounces) of Pu-238. In March 2017, Ontario Power Generation (OPG) and its venture arm, Canadian Nuclear Partners, announced plans to produce Pu-238 as a second source for NASA. Rods containing Np-237  will be fabricated by Pacific Northwest National Laboratory (PNNL) in Washington State and shipped to OPG's Darlington Nuclear Generating Station in Clarington, Ontario, Canada where they will be irradiated with neutrons inside the reactor's core to produce Pu-238. In January 2019, it was reported that some automated aspects of its production were implemented at Oak Ridge National Laboratory in Tennessee, that are expected to triple the number of plutonium pellets produced each week. The production rate is now expected to increase from 80 pellets per week to about 275 pellets per week, for a total production of about 400 grams per year. The goal now is to optimize and scale-up the processes in order to produce an average of 1.5 kg (3.3 lb) per year by 2025. The main application of Pu-238 is as the heat source in radioisotope thermoelectric generators (RTGs). The RTG was invented in 1954 by Mound scientists Ken Jordan and John Birden, who were inducted into the National Inventors Hall of Fame in 2013. They immediately produced a working prototype using a 210Po heat source, and on January 1, 1957 entered into an Army Signal Corps contract (R-65-8- 998 11-SC-03-91) to conduct research on radioactive materials and thermocouples suitable for the direct conversion of heat to electrical energy using Polonium-210 as the heat source. RTG technology was first developed by Los Alamos National Laboratory during the 1960s and 1970s to provide radioisotope thermoelectric generator power for cardiac pacemakers. Of the 250 plutonium-powered pacemakers Medtronic manufactured, twenty-two were still in service more than twenty-five years later, a feat that no battery-powered pacemaker could achieve. This same RTG power technology has been used in spacecraft such as Pioneer 10 and 11, Voyager 1 and 2, Cassini–Huygens and New Horizons, and in other devices, such as the Mars Science Laboratory, for long-term nuclear power generation. ^ Rebuilding the supply of Pu-238. Oregon State University. ^ US restarts production of plutonium-238 to power space missions. David Szondy, New Atlas. 23 December 2015. ^ "Isqua Istari " The density of Plutonium". blog.hawkbats.com. Retrieved 2017-11-07. ^ "MLM-CF-67-1-71 Plutonium 238 Oxide Shipment No. 33" (PDF). 1966-12-30. ^ "Little Known Pu Stories" (PDF). ^ G. R. Grove to D. L. Scot (1963-01-21). "Trip Report" (PDF). ^ "Final Safety Analysis Report, January 15, 1975 (MLM-ENG-105)". ^ Carol Craig. "RTG: A Source of Power; A History of the Radioisotopic Thermoelectric Generators Fueled at Mound (MLM-MU-82-72-0006)" (PDF). Archived from the original (PDF) on 2016-08-16. ^ Karl Z. Morgan; et al. (1964-03-01). "Health Physics Journal, Vol. 10, No. 3 - Relative Hazard of the Various Radioactive Materials". ^ Werner, J.E. ; Barklay, C.D. ; Bickford, W.E. ; Lord, D.B. (2013). Summary of Plutonium-238 Production Alternatives: Analysis Final Report (PDF) (Report). Idaho National Laboratory. INL/EXT-13-28846. ^ "Process for producing ultra-pure ... - Google Patents". Retrieved 2011-09-19. ^ a b c d e Caponiti, Alice. "Space and Defense Power Systems Program Information Briefing" (PDF). Lunar and Planetary Institute. NASA. Retrieved 24 March 2015. ^ Steven D. Howe; Douglas Crawford; Jorge Navarro; Terry Ring. "Economical Production of Pu - 238: Feasibility Study" (PDF). Center for Space Nuclear Research. Retrieved 2013-03-19. ^ "Plutonium-238 Is Produced In America For The First Time In Almost 30 Years". Australian Popular Science. Retrieved 2017-03-01. ^ "SRS - History Highlights". www.srs.gov. Retrieved 2017-11-30. ^ "Commonly Asked Questions About Radioisotope Power Systems" (PDF). Idaho National Laboratory. July 2005. Archived from the original (PDF) on September 28, 2011. Retrieved 2011-10-24. ^ "Plutonium-238 Production Project" (PDF). Department of Energy. 5 February 2011. Archived from the original (PDF) on February 3, 2012. Retrieved 2 July 2012. ^ Clark, Stephen (20 March 2013). "U.S. laboratory produces first plutonium in 25 years". Spaceflightnow. Retrieved 21 March 2013. ^ Walli, Ron (22 December 2015). "ORNL achieves milestone with plutonium-238 sample". Oak Ridge National Laboratory. Retrieved 22 December 2015. ^ Harvey, Chelsea (30 December 2015). "This is the fuel NASA needs to make it to the edge of the solar system - and beyond". The Washington Post. Retrieved 4 January 2016. ^ United States to ship neptunium to Canada as part of Pu-238 production. International Panel on Fissile Materials. 5 March 2017. ^ a b Scientists Are Automating Plutonium Production So NASA Can Explore Deep Space. Daniel Oberhaus, Motherboard. 9 January 2019. ^ Scientists Find a New Way To Create the Plutonium That Powers Deep Space Missions. David Grossman, Popular Mechanics. 9 January 2019. ^ National Inventors Hall of Fame - John Birden. ^ Kathy DeLucas; Jim Foxx; Robert Nance (January–March 2005). "From heat sources to heart sources: Los Alamos made material for plutonium-powered pumper". Actinide Research Quarterly. Retrieved 2015-07-09. Story of Seaborg's discovery of Pu-238, especially pages 34-35.